So I haven't posted in a couple of days, what is going on? Wasn't I in the middle of the 31 Day Challenge? Didn't I promise you animal print and flower nails? What about next week? The answer I am afraid is I really don't know. Firstly let me state that I will be backdating the entries form this challenge as I have loved doing this so maybe you will get a couple of days extra at the end, or I will post on one weekend to make up for it. I am not totally sure yet. Anyway the reason for this uncertainty is that I am stranded away from my polish supplies (and a decent camera) due to freak British snow. Basically I went home pre-birthday to see my family and then BAM, snow and ice and no way of getting back. 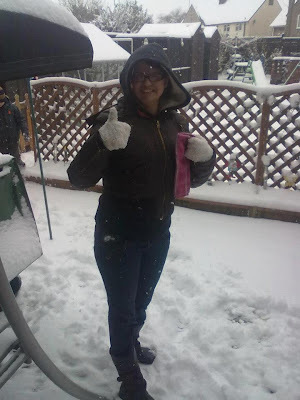 Here is a photo of myself frolicking in the snow for you entertainment and hopefully I will be back on track soon.